The very Scottish city of Dunedin is affectionately known as “the Edinburgh of the south.” Dunedin is renowned for its abundance of Victorian and Edwardian architecture, as well as its proximity to rare wildlife, including the only mainland breeding colony in the world of Albatross, and the rare Yellow Eyed Penguin. Majestic Victorian and Edwardian architecture, a proximity to an abundance of spectacular wildlife and a lively youth culture make for a fascinating and exciting melange in this eminently human-sized city. The city of Dunedin is framed by a magnificent harbour, long and picturesque. It sits on the doorstep of Otago Peninsula, which has long been acclaimed for its beauty and wildlife. The Otago Peninsula boasts the world’s only mainland breeding colony of the Albatross as well as fantastic viewing of the rare Yellow-Eyed Penguin, New Zealand Fur Seals and other ocean birds and mammals in their natural habitat. The city is a picture postcard of historic buildings and houses, set against a backdrop of the city’s lush greenbelt of native bush. Fondly known as the ‘Edinburgh of the South,’ Dunedin celebrates its Scottish ancestry and treasures its icons. Dunedin is widely regarded as the best preserved Victorian and Edwardian heritage city in the southern hemisphere, boasting many historical masterpieces. Once the centre of European commerce and culture in New Zealand, Dunedin retains an elegant grandeur often missing from larger cities in New Zealand and combines it with the vibrancy of youth and culture. Dunedin maintains its position of importance to the country as a major seat of learning with a strong arts and cultural influence. The University of Otago – NZ’s oldest university and home to Dunedin’s large and lively student population – boasts 130 year old blue stone buildings equal to those seen at Oxford or Cambridge. Its adjacency to the city also makes Dunedin especially suitable as a venue for education and medical associated conferences. A compact city with a population of 122,000 (student population of 23,000) Dunedin is located on the south east coast of the South Island of New Zealand. It is a safe and compact city with most hotels and restaurants being within easy walking distance of the city Centre ‘The Octagon’. Dunedin is New Zealand’s largest City by area and arguably the most spectacular in terms of contrasting landscapes. There are kilometres of stunning panoramas – across Otago Harbour and Peninsula or the majestic sweeps along the sandy beaches of St. Clair to the stunning little “secret places” such as Tunnel Beach and the haunting rocky tors and tussock of Middlemarch, our hinterland and the starting point for the Otago Central Rail Trail. The seaside settlements of Karitane and Port Chalmers provide the perfect setting to escape the city for the day. Dunedin offers much to stir the senses. Ca. 120.000 people usually live in Dunedin City. Ca. 8500 Māori usually live in Dunedin City. Dunedin is a very accessible city and if you do not have a vehicle, buses and taxis are plentiful and reliable. At the airport: many taxi companies operate cars and airport shuttles into the city. Fares vary, so make sure you ask before you board. The major rental car companies are located within the airport terminal. Getting around Dunedin is relatively easy as distances to major places of interest are not great. If you wish to travel independently, your transport options include public bus, rental car or taxi. There are also a number of tour companies which give you the opportunity to experience Dunedin city and Otago Peninsula without the hassle of organising a tour yourself. As distances to places of interest in Dunedin are not great, taxis are reasonably cheap by New Zealand standards. Driving times within Dunedin are short compared with other, larger cities. 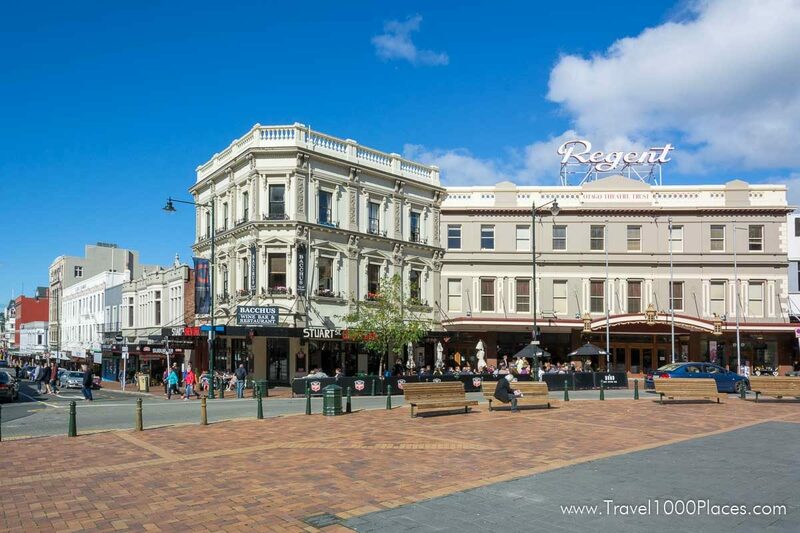 Due to Dunedin’s compact size most of the attractions in the city are situated within 5 to 10 minutes drive of one another, and most are within walking distance. When visiting attractions on the Otago Peninsula, allow 30 minutes drive from Dunedin city centre to Larnach Castle and the New Zealand Marine Studies Centre and Aquarium, and 45-60 minutes to Taiaroa Head, including the Monarch Wildlife Cruise from Wellers Rock, Penguin Place, the Royal Albatross Centre and Natures Wonders. Once on the Peninsula, allow 20 minutes drive to/from Larnach Castle and the New Zealand Marine Studies Centre and Aquarium, and 30 minutes from either of these attractions to/from Taiaroa Head. These estimated times allow for a leisurely ride and some stops but are not meant to be sightseeing trips. Dunedin City has a proud history much of which is based around the strong Scottish influence in setting up the city. The first settlers set out for Dunedin aboard the John Wickliffe and the Philip Lang vessels in late 1847 with the John Wickliffe arriving on 23 March 1848 followed shortly after by the Philip Lang on 15 April. The city gained its name from the old Gaelic name for Edinburgh, Dunedin. The Scottish heritage is evident in Dunedin with street names taken from Edinburgh street names and famous Scottish rivers.